The Commission on Election (Comelec) office here will continue its clearing operation in the coming days even after the removal of six to eight truckloads of illegal campaign posters of local candidates around the city. 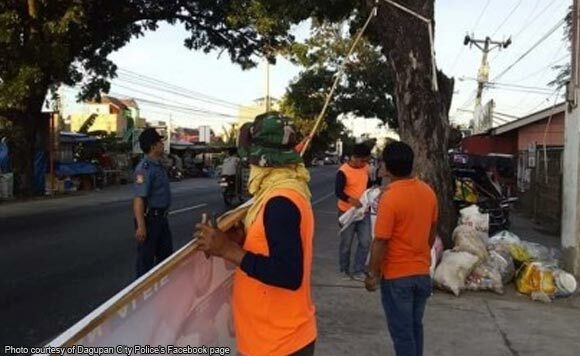 City election officer, lawyer Michael Sarmiento, said Thursday they have collected the campaign paraphernalia from their first “Oplan Baklas”, or the removal of illegal campaign posters, during the previous day. “It’s a province-wide activity initiated by Comelec, in partnership with different agencies, such as the Philippine National Police, Bureau of Fire Protection, Department of Environment and Natural Resources, and the Parish Pastoral Council for Responsible Voting,” he said. Sarmiento noted that more posters need to be taken down, thus, there will be another schedule of Oplan Baklas in the city. “(Some) 90 percent of the posters are oversized, while some are in prohibited areas, like electric lines or trees,” he said. Sarmiento reminded the candidates and their supporters of the approved size of posters, which is not more than 2 feet by 3 feet, and they should not be posted on trees or electric cable wires or in private properties without the consent of the owner. “But even if the poster is in private property or in cars or motorcycles, it should still follow the legal size. And also, it should not be posted on government-owned vehicles or facilities,” he explained. Sarmiento further said the removed illegal campaign posters are kept in the Comelec office, which will later serve as evidence for electoral complaints.